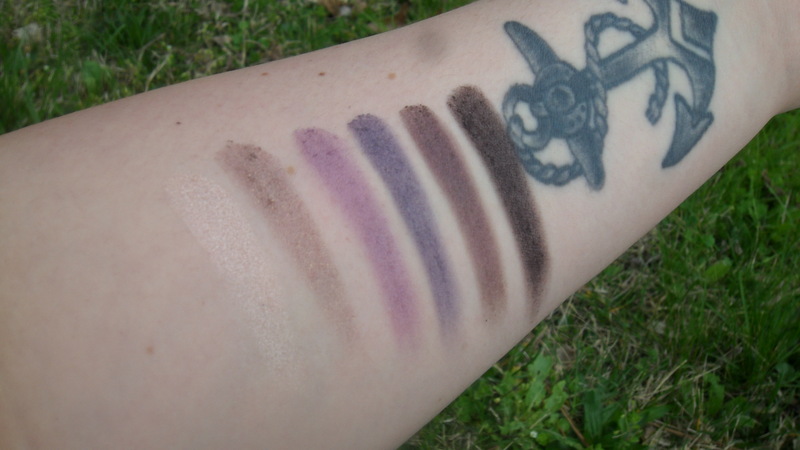 This Saturday I have some swatches a review! I was picking something up at Walgreens and *somehow* ended up in the makeup section, but I found one of the new Fergie eyeshadow palettes! I was actually convinced my city was not going to get these because I have not even seen displays for them. I grabbed “Paris Runway” even though it wasn’t my favorite one. The neutrals palette was out of stock though, of course. Now I have a bit of hope though, and I will keep searching for it! Anyway, this palette has 10 colors in it and comes with a brush! The brush does feel a bit cheap, in my opinion, but would probably be perfect for someone just starting out with makeup and brushes. The brush is dual sided, one side being the blending side and other side is flat. On the back of the palette it says, “this incredible palette of intensely pigmented shadows comes in a range of textures from translucent highlights to subtle mattes.” Alright, so to nip this in the bud quickly, there are no “subtle” mattes in this palette or anything close to a matte shade. This is a very glittery and shimmery palette, so chances are you will have to use other palettes with this if you’re like me and like matte transition and blending shades. Packaging: It’s in a cute black package, but it does feel light and a bit cheap. However, Wet n Wild is a cheaper drugstore brand. It is very compact and would be easy to travel with though. Color Range: Okay, so this is my biggest problem with the palette. There’s not a huge color range. The two lightest shades are GORGEOUS and then there are a few pretty purple shades and then the rest are super dark and look the same to me. I think this palette would’ve been a huge hit for me if there had been at least 1-2 true matte shades and a few more lighter shades. I don’t find the need to have 5 very dark shades in one palette. Pigmentation: These are pretty pigmented, but I did notice some of the colors getting those weird little shadow balls when I was swatching them, but that happens with a lot of shimmery shades. These are decently pigmented. The first two shades are my absolute favorites. They are so pretty and shimmery. Even though I’m not the biggest fan of this palette as a whole, those two shades make me happy. I’m weird like that. 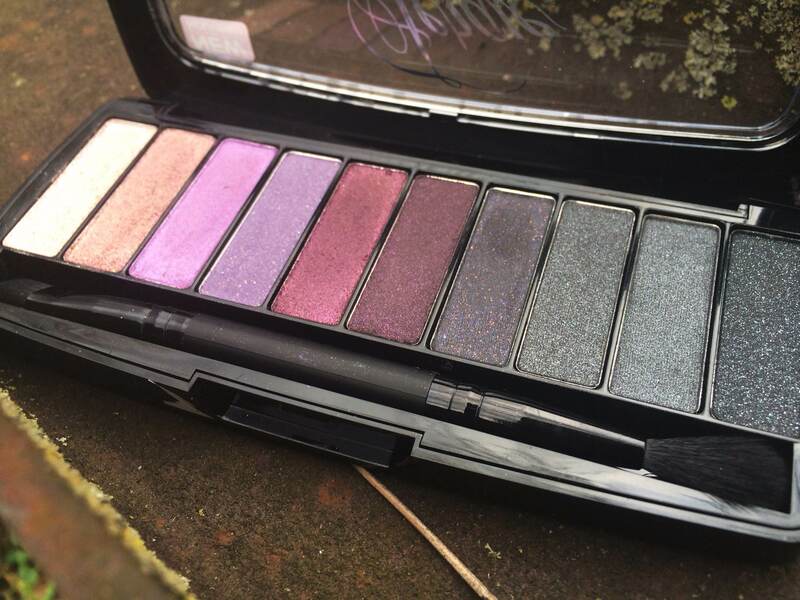 What I love: I love the pink champagne shade in this palette and the purple shades. The price is awesome and I got a lot of product for the little I paid for it. I do love that it has a brush with it, and the colors are pigmented. 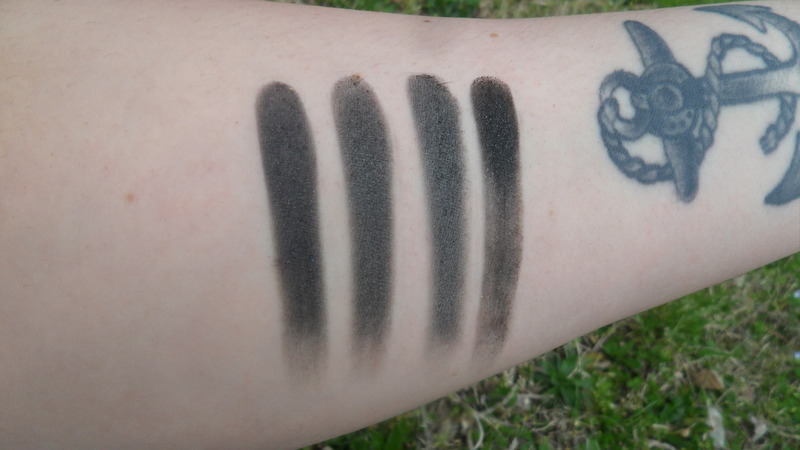 The shades aren’t super buttery, but they’re not chalky like some wet n wild shades can be. I would rather have to work to build color up a bit over looking like I’m sporting chalkboards on my eyelids. Overall thoughts: This palette will probably be awesome for someone that loves glimmer and shimmer and smoking out their eyes often. 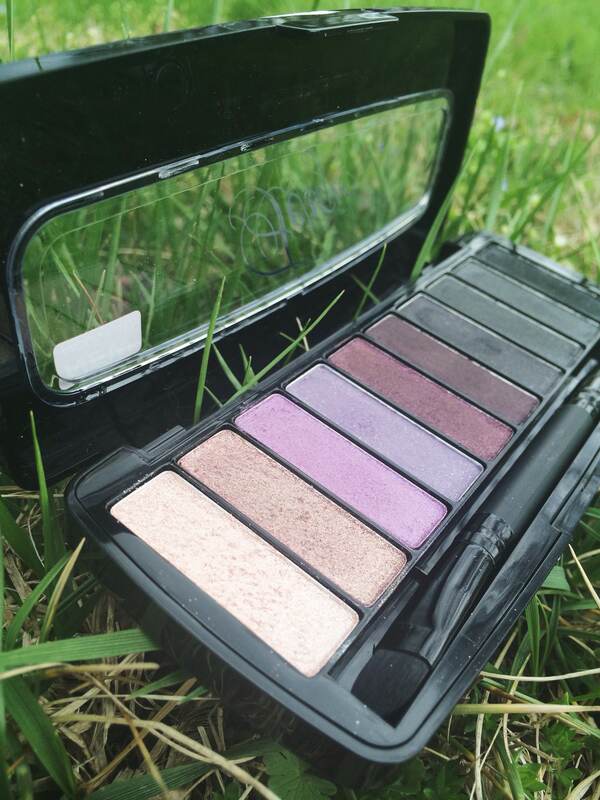 I think that if you don’t wear dark shadows often you may want to pass on this one. I like the palette overall, but I think I will like the neutral one more if I can actually find it!